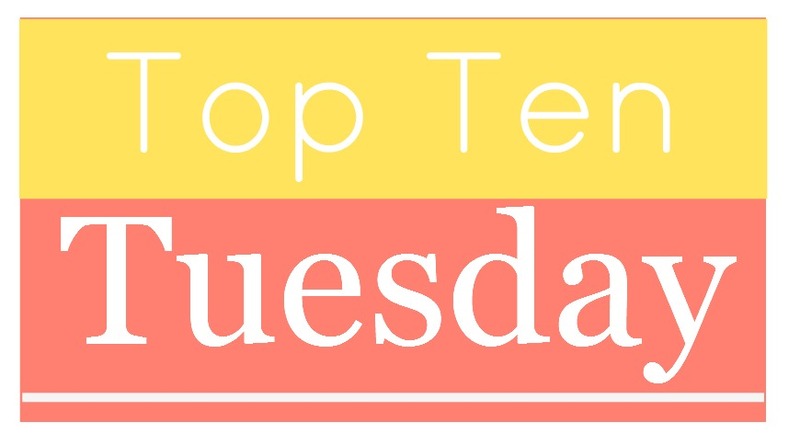 Top Ten Authors on my Auto-Buy List. 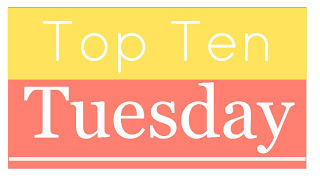 It has been quite some time since I've participated in a top ten tuesday post, but I just couldn't pass this one up. Since I generally only talk about classics here, it may seem odd that I continually purchase new releases. There are a number of authors that I purchase on a regular basis, even though I haven't read their work in years (eek). It drives my husband batty, and I'm sure it doesn't make all that much sense, but I know that one day, in the right moment, I will return to my loves. :) So, without further delay, the authors I buy from on a regular basis. J.K. Rowling: This one is really a no-brainer. I own all of her work, including A Casual Vacancy. While I haven't gotten to that newest release just yet, I will in time. Robin McKinley: I own all of McKinley's works, and I purchase her books when they come out (the most recent being Pegasus, which I have reviewed at some point on the blog). I love McKinley. Her books are usually fairy tale retellings or original fantasy. Orson Scott Card: While I really despise Card as a person, I still have a soft spot for his work. Inevitably, his books find a way into my hands and back home with me. John Green: I first discovered Green a number of years ago when a somewhat battered copy of Looking for Alaska found its way into my hands at the bookstore. Since then, I have sought out and purchased all of his books shortly after publication. Rick Riordan: While I haven't read all the Riordan I own (The Kane Chronicles come to mind), I will continue to purchase his books as they are published. I love his writing and the "fun" element of his stories! Markus Zusak: I'm not sure if Zusak really counts, since his last book, The Book Thief, was published way back in 2005 (when I bought it and read it). But when he does publish his new book, I will be the first one to run to the store to buy it. Jennifer Donnelly: This is another new writer to me, but after reading two of her books, A Northern Light and most recently, Revolution, she is a writer that I will return to on a regular basis, especially with the publication of new titles! Brandon Sanderson: Sanderson is relatively new to me, but I know he is a writer I will be exploring more of in the future, especially since I have enjoyed his work thus far. He is most definitely a writer I will automatically buy! Neil Gaiman: I've been collecting Gaiman titles since I was in high school, and I doubt I'll stop, even though I haven't read anything by him in a long time! I always grab his new books off the shelf when they come out, and they sit waiting on my shelves. John Flanagan: Flanagan is the author of one of my biggest guilty-pleasure series, The Ranger's Apprentice. He has since moved on to a parallel series, which I have also purchased and loved. I will continue to purchase his new books as they debut! There you have it. What authors do you automatically buy? Weekly Wrap-up for February 24, 2013: Busy, Busy. Then we have testing next week, so of course that is screwing up our schedules and throwing everything off. Ugh, it's going to be a miserable push. Besides all of that, we have conferences after school in the next couple of weeks, more PD, and the end of third quarter is fast approaching. This school year is FLYING by, isn't it? With all of that going on, I doubt I will have a lot of time to read. I just collected a set of essays, so there goes my free time. I'm still hopeful that I'm going to get through Anna Karenina before the end of the month (so I can start A Modern March with nothing lingering). 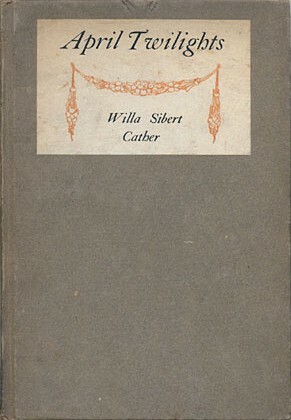 April Twilights by Willa Cather (The Willa Cather Project). Anyway, I began my Cather reading by diving into her poetry and was surprised to see that I really enjoyed it. Granted, there were a few that didn't strike a chord with me, but Cather was a pretty good poet. As I read through April Twilights, I found myself drawn to the pastoral poems, since that is the writing I have read and associated with her. One of my favorites was "The Hawthorn Tree:"
I just love the flow and feeling behind that poem-and it reminds me of O Pioneers! Only the wraith of song, sweet, sweet and cold. Sweetheart! The way from Hell's so long, so long! I suppose I felt drawn to that one because of my recent mythology class. But the feeling and emotion just grabbed me. In all, I really enjoyed the collection of poems. You can tell that Cather was trying some things out as the poems progressed, and that she was still finding her voice as a writer. I'm looking forward to seeing how that transitions as she moves into short stories and novels! 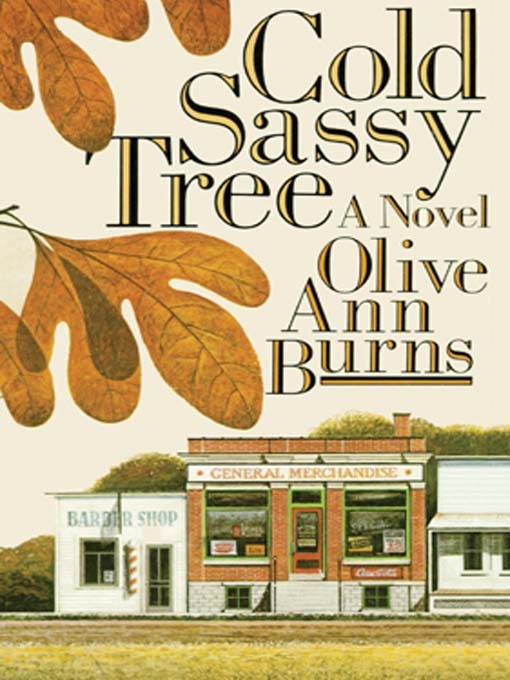 Book 152: Cold Sassy Tree by Olive Ann Burns. Generally speaking, I have a really good memory for books that I've read before. And before starting Cold Sassy Tree, it sounded familiar. And, as I began to read, I knew it was something I had read before-I just couldn't remember when! It was only after posting about my frustration on Facebook that a high school friend reminded me that it was one of the books we read as sophomores in our English classes. After that confusion was solved, I was content to just let the memories come back to me. This is definitely one of the "modern" classics on my list, but that doesn't really matter. The novel just flows from one piece to the next, and it has an older charm that just sucked me in. I loved my reread, and while I remembered scenes and pieces, there were other parts that just blew me away. First, this novel is absolutely hilarious. The antics of the characters had me laughing repeatedly (the scene where Will tells his friends that his aunt nursed a pig...oh, I was DYING). 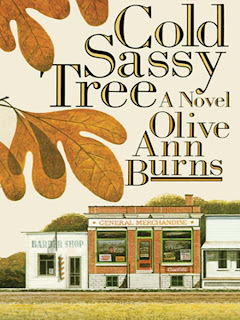 The scenes didn't feel forced, but seemed to be things that could actually happen in a slow, sleepy Southern town like Cold Sassy. In many ways, it made me wish that I had the opportunity to grow up in a close-knit community. Coupled with the hilarity was that feeling of closeness. Cold Sassy is a small community, where everyone knows everything. Since I don't come from a town like that (my city is quite a bit larger), I've never had the feeling that everyone knows everything. I imagine it could be quite annoying, but in Cold Sassy, it made me chuckle. I love that the little old ladies have nothing better to do than spy on their neighbor and gossip. That kind of environment in a novel just makes me smile. The episodic nature was also something I was drawn to. While there was certainly an over-arching storyline in the novel, you could feel comfortable reading a few chapters at a time to get through an episode before setting it aside (I didn't really do that since I was hooked, but you could!). The smaller stories really opened up the plot and gave you insights into the community and why it functioned the way it did. But most of all, I loved the feelings I had when I read this. There were moments of poignancy that just hit me in all the right places. My entire experience of reading about Will Tweedy, his grandfather, and the town of Cold Sassy was just warm. I felt enveloped in the story for its entirety and I didn't want it to end. I could also tell you about the wonderful Miss Love, who I just wanted to hug for the majority of the novel, or the sad fate of Lightfoot McLendon (who really did break my heart), or the scene with the automobiles in town. But you need to read this. It is a book full of warmth and insights of life in a small Southern town. It has that charm and heart that you only get by reading about a small community. I want to add that I looked into seeing if the school district still has this book on their approved curriculum, and they do (I teach in the same district I graduated from, but at a different school)! I found some old copies of the book in a back storage room, so perhaps at some point in the future, I can pull this into my American lit curriculum. It really is a great book, and one that I think a lot of my students would enjoy. It is a great balance between reflecting an American time and place and fun moments. I've done this cute little meme a few times before, and since it has been a few months, I decided it was time to pull it out once more. :) Let me know if you decide to participate! A little bit of everything. :) I'm working on a new writing project (only a little at a time, since typing for too long kills my hands). I've also been revamping lessons and creating new resources for my students. I typed up a sample essay for The Great Gatsby last week since I wanted them to see what I was going for! I also spent some time last night catching up on writing some posts! ...we're looking at purchasing a home before the end of the year! We've done all kinds of budgeting, etc, and I think we'll be ready to make that big step towards searching for a new home by the fall. In the meantime, we keep looking online for houses and gathering ideas about what we want. :) It's a fun hobby! A lot about going gluten free! My doctor suggested it as a way to feel healthier, and I have to say, since reducing my gluten intake (to almost nothing), I have felt a lot better. It's a challenge, for sure, but I like feeling like I am doing good things for my body. Just a little achy today. I've been fighting off a cold for the last week or so, and I think it's starting to settle in (yuck). Hopefully it is over with soon. The Muse concert in a couple of weeks! Its going to be a blast (we have floor tickets). I'm also excited to get to my Spring Break. I thought that I would have time this weekend (no school yesterday or today) to go through clothes to donate, but I just couldn't get to it. I can't wait to clean everything out and get rid of our extra clutter. For a good night's sleep tonight. My aches and sniffles kept me awake last night. Buying new clothes (my pants were too big). The Willa Cather Project Update. Back near the beginning of January, I launched The Willa Cather Project. The goal of the project is to read through Cather's complete works in chronological order (with the exception of My Antonia, which I read right before starting the project) in however long it takes me. I made a big list, a dedicated page, and have been steadily working forward ever since. To be honest, I didn't think I was going to be as sucked in to the project as I have been. I'm flying through Cather's works, and if I continue at the rate I'm reading, I'll finish her complete works by the end of the summer (I know, right?). In any case, I thought that now would be a good time to check in and let you know how I'm doing...and also inspire you to take on a project of your own. I would say that I am making steady progress, wouldn't you? I've found that I really love the idea of reading through Cather's works in order...it is so nice to see her grow as a writer, become more confident in her voice and style, and the stories...they just get better. I'm still in the middle of her earlier work and the focus right now is on her "prairie" series. I started The Song of the Lark last night, and I am already hooked. I've also decided that I want to finish by the end of 2013 so I can begin a new project with the new year. We'll see if I can make it. If you've taken on a similar project, how have you fared? Have I encouraged you to start your own project? Let me know! 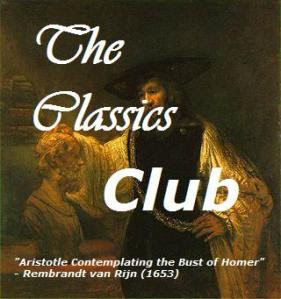 The Classics Club is hosting a "Classics Spin," where we make a list of 20 books off of our Classics Club list, wait for a number to be chosen, then make sure to read that book by the deadline (deadline is April 1)! I'm a little late to the game, since the number will be announced in the morning, but I'm sneaking in. You can divide the books into categories to make the game more fun, or you can just list 20 titles. I decided to divide (mainly because of my crazy tendencies). The lucky number was 14, so I get to read the Angelou! I'm pretty excited about the book choice (especially that I'm not reading one of the chunksters), since it was a book I needed to get to at some point this year! Let me know what you ended up with according to the spin! Weekly Wrap-up for February 3, 2013: February Reading Plans. Between school, Matt's illness last week, and the stress of just keeping up with everything, this week went by rather quickly. I'm actually a bit behind in grading and planning, so today's post will be on the short side. The only school-related thing I'll mention is that we're in the midst of The Great Gatsby and while not all of my students love the novel, there are a few who do! I've been trying to get them to see some of the smaller details as we go along, which is helping them understand the bigger ideas. I'm sure that when we finish the novel on Tuesday/Wednesday, I'll have to help make those connections. In terms of my own reading, it slowed down a LOT from where it was at the beginning of the year. I did read Alexander's Bridge this past week, and obviously I am in the middle of The Great Gatsby with my students, but reading has taken a little bit of a backseat (and will until I catch up on some grading). I do have some things sitting on my desk that I want to get to before my Modernist event kicks off in March. I'd really like to finish Forster's A Passage to India, which I started last JUNE and haven't finished yet. There is also Anna Karenina, which I started early in January and set aside for a few weeks. Ideally I'd also like to read a Dickens novel (A Tale of Two Cities) in honor of his birthday month, but that isn't a priority. I'm also extremely focused on my Willa Cather Project. I've finished 4 titles so far (of the 7 books I've finished this year), and I don't see an end in sight. It feels good to be experiencing her work one right after the other, so I imagine I'll dive into O Pioneers! this month, as it is the next title on the project list. Anyway, a stack of papers to grade and some breakfast is calling to me. I hope you all have wonderful reading week!